By John F. McKenna (McJack): World Boxing Organization (WBO) Welterweight Champion Manny Pacquiao (53-3-2, 38 KO’s) is vowing to win convincingly when he faces off against WBO, WBA and The Ring Lightweight Champion Juan Manuel Marquez (53-5-1, 39 KO’s). The pair will have their Trilogy on November 12 at the MGM Grand in Las Vegas. Pacquiao said in his Philboxing.com column, “Kumbinayson” that he is anxious to get into the ring against his long time nemesis Marquez. “I’m excited to fight and prepare for my 3rd fight against Marquez so I can prove I won the first two fights,” said Pacquiao. “Pacman” says that he will make sure there is no more controversy when he defeats “Dinamita” this time. The first bout between Pacquiao and Marquez in 2004 ended in a draw despite Marquez being knocked down three times in the first round. Juan came on in the later stages of that fight to even things up. In their 2nd fight in 2008 Pacquiao won a controversial split decision. It must be pointed out that Pacquiao has moved up in weight class since the first two fights. In the process of getting bigger and packing on more muscle Manny has retained his explosive speed and power. In addition Marquez will be 38 years old by the time the fight with Pacquiao takes place. There has been some question as to whether or not he has lost any speed and how much he still has left in the tank. Name recognition was a huge factor in Top Rank Promoter Bob Arum choosing Marquez as Manny Pacquiao’s next opponent, just as it was when he chose an over the hill Shane Mosley to be Manny’s opponent last May. Being a good fighter isn’t good enough. Promoters and champions who put their titles on the line want to ensure that who they fight will have the name recognition to draw huge crowds at the box office. It’s an old overused term, but it really is all about the money. 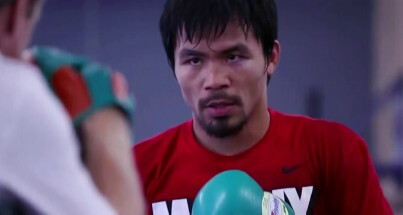 Ticket sales for the Pacquiao – Marquez Trilogy have been brisk. According to Yahoo Sports scribe Kevin Lole only 2000 tickets remain. And reportedly that is all before Manny Pacquiao has signed the contract.